Chinese takeout anyone? 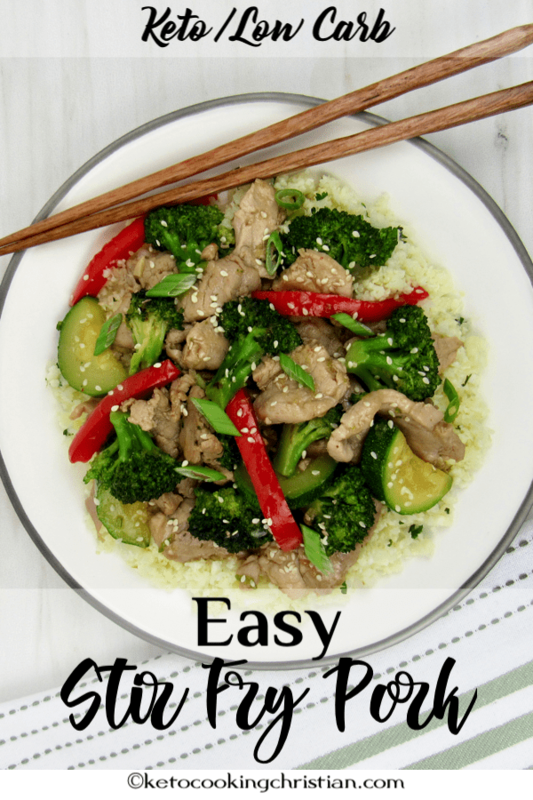 This quick and easy stir fry has great flavor and will satisfy your cravings for takeout! I must admit, once in a while I crave Chinese take food, in fact I don’t know many people who don’t! But being on a Keto and Low Carb diet, of course we don’t want all the sugar and carbs. 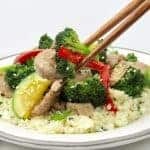 I use pork tenderloin in this stir fry, along with some Keto friendly veggies. 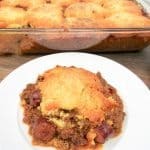 The great thing about this recipe is you can change things up according to what you have on hand or what you like. 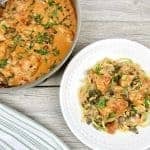 I like using pork tenderloin in this because it cooks quickly and is super tender, but you can use beef, chicken or shrimp instead. I use broccoli and zucchini, but you can use mushrooms, cauliflower, snap peas, whatever you like! 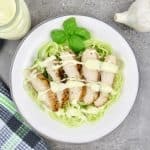 This recipe only takes about 20 minutes to make, so it’s perfect for a week night Low Carb dinner! Heat a large skillet over medium high heat, add in the oil and cook the pork 3/4 of the way through. Remove and set aside. Add in the broccoli, with a little water, and allow to steam with a lid on for about 3-4 minutes or until mostly cooked through. 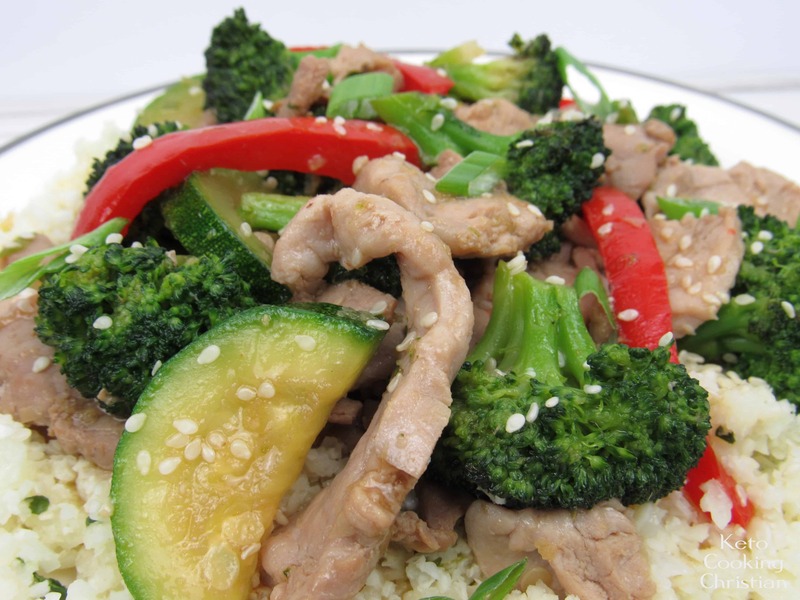 While the broccoli is steaming, add the liquid aminos, oyster sauce, chicken stock and toasted sesame oil to a cup. Whisk together, then set aside. Remove the broccoli from the pan and set it aside..
Add in some oil (I used avocado oil) and sauté the garlic and ginger for about 20 seconds, careful not to burn it. Then add in the zucchini, scallions and red peppers. 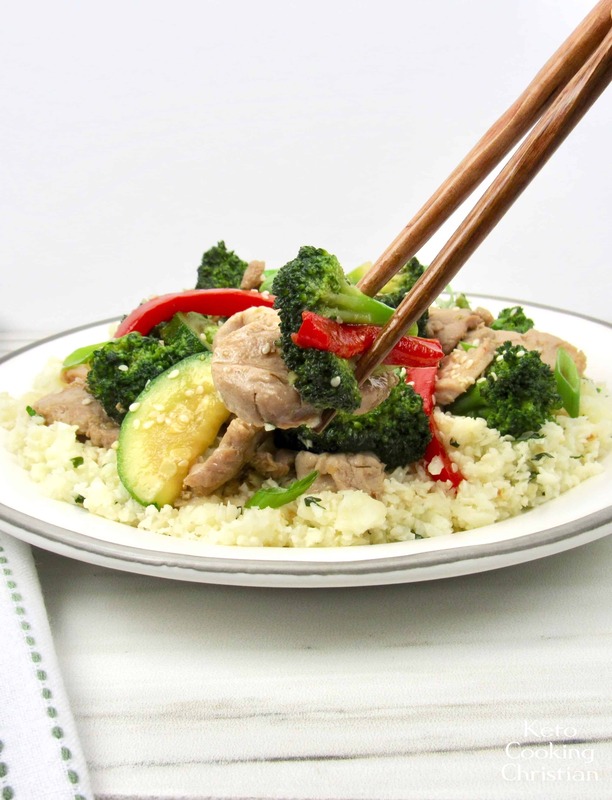 Stir for about a minute, add the broccoli and pork back in and pour the sauce over the top. Stir until combined and cook for another 5 minutes or until everything is cooked through. 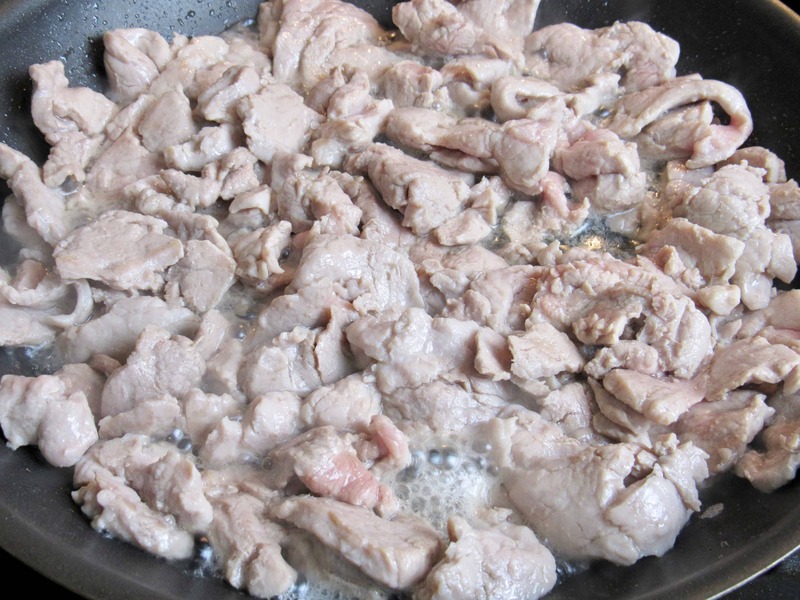 Remove the pork and veggies from the pan, leaving just the sauce behind. Combine the Glucomannan powder with a tablespoon of water in a cup and stir to dissolve. 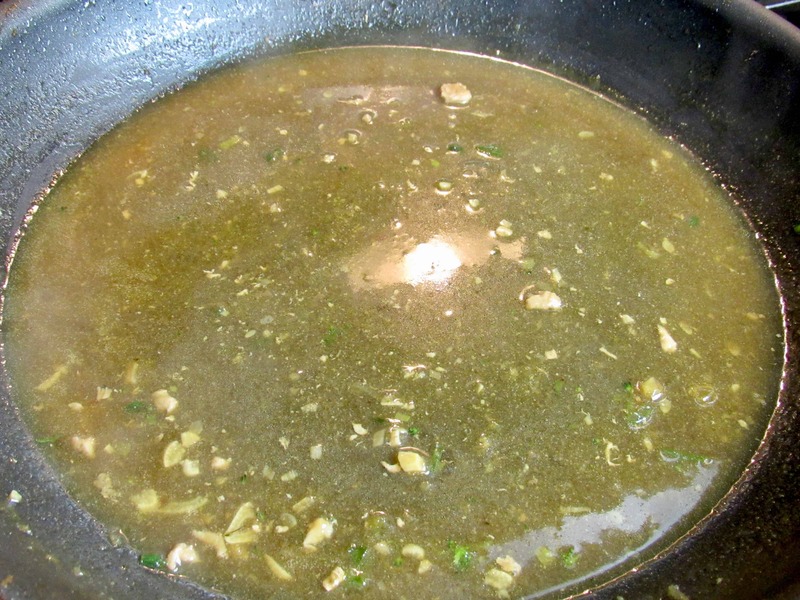 Pour into the sauce, while whisking and cook the sauce until it has thickened to your liking. Mine only took about 1-2 minutes to thicken. 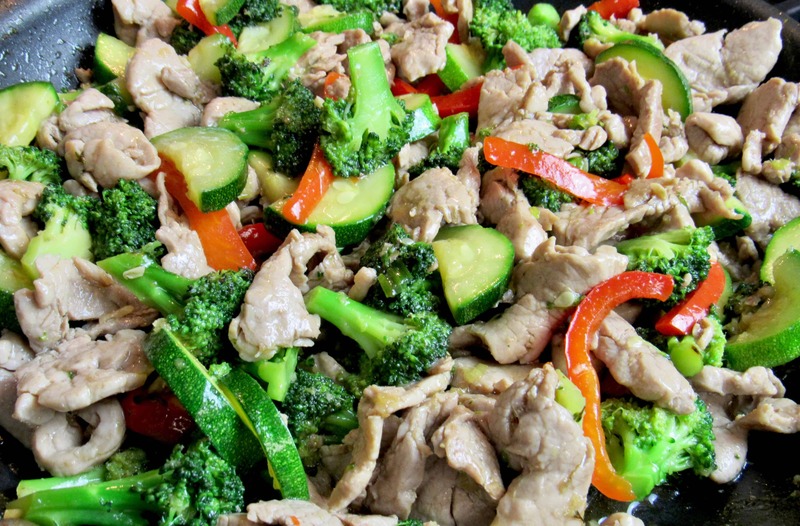 Add the pork and veggies back in and toss to coat in the sauce, then serve. I poured mine over my Lime Cilantro Cauliflower Rice and garnished with some sesame seeds. 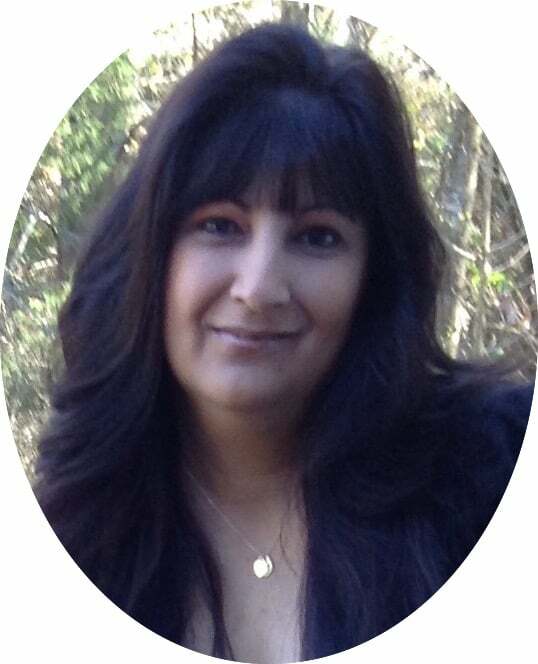 Note: If you cannot get Glucomannan Powder, you can use Xanthan Gum instead. 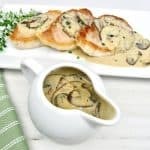 I prefer the Glucommannan because it doesn’t get slimy like Xanthan Gum can in sauces like this. With that said, if you use too much, it will take on a strange texture, similar to Shirataki noodles, because in fact this is what is used to make them! Glucomannan is soluble fiber and is derived from the Konjac root. Heat a large skillet over medium high heat, add in the oil and cook the pork 3/4 of the way through. Remove and set aside. Add in the broccoli, with a little water, and allow to steam with a lid on for about 3-4 minutes or until mostly cooked through. 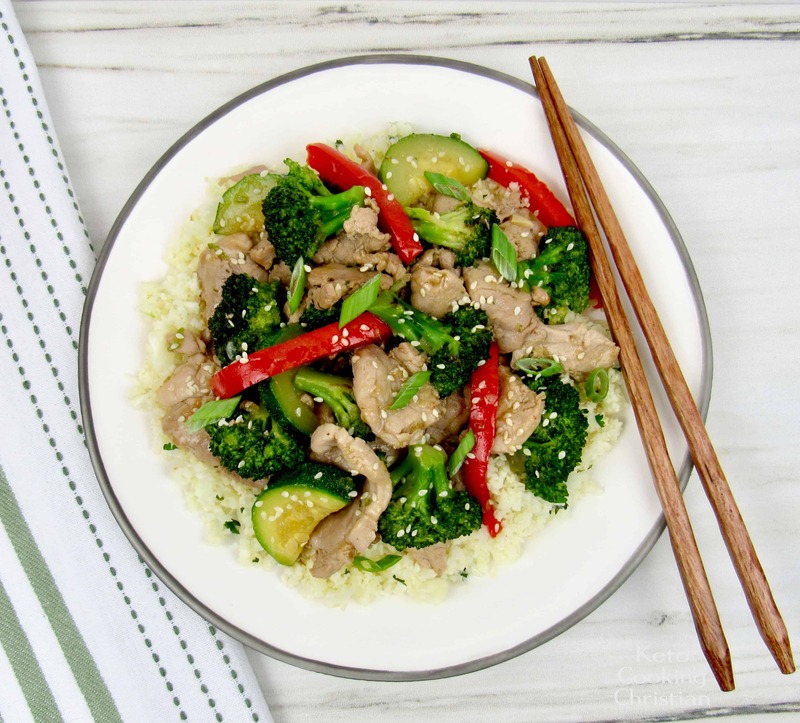 While the broccoli is steaming, add the liquid aminos, oyster sauce, chicken stock and toasted sesame oil to a cup. Whisk together, then set aside. 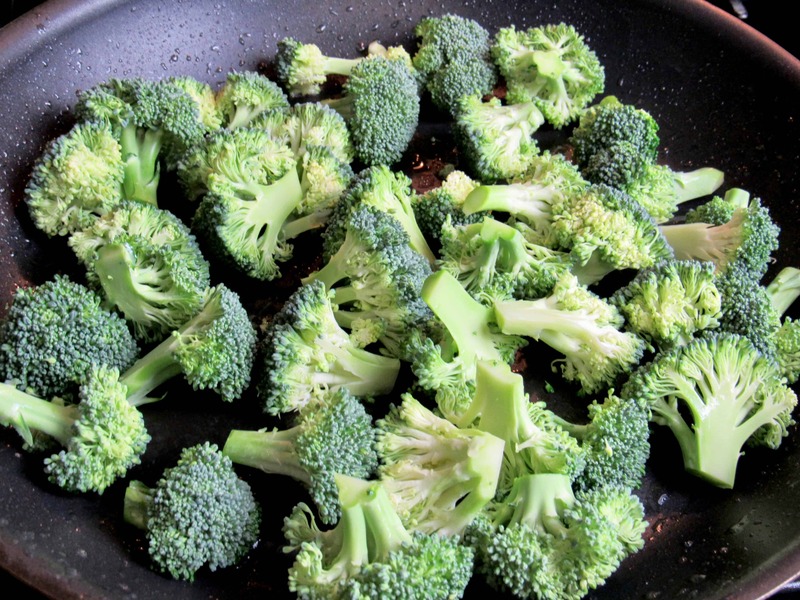 Remove the broccoli from the pan and set it aside. 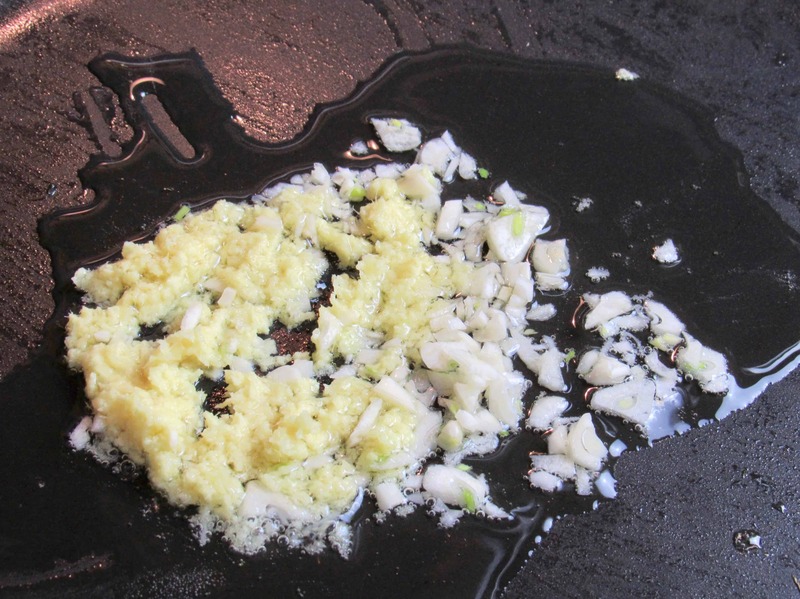 Add in some oil (I used avocado oil) and sauté the garlic and ginger for about 20 seconds, careful not to burn it. 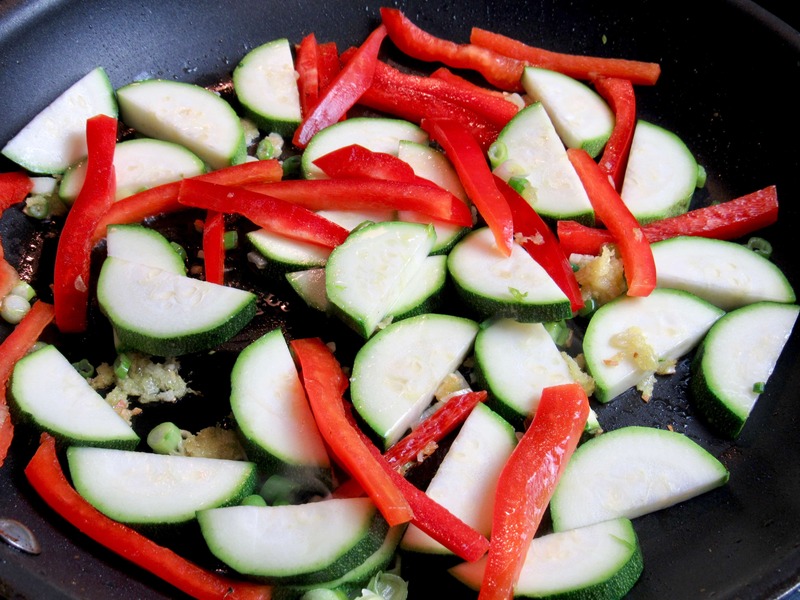 Then add in the zucchini, scallions and red peppers. 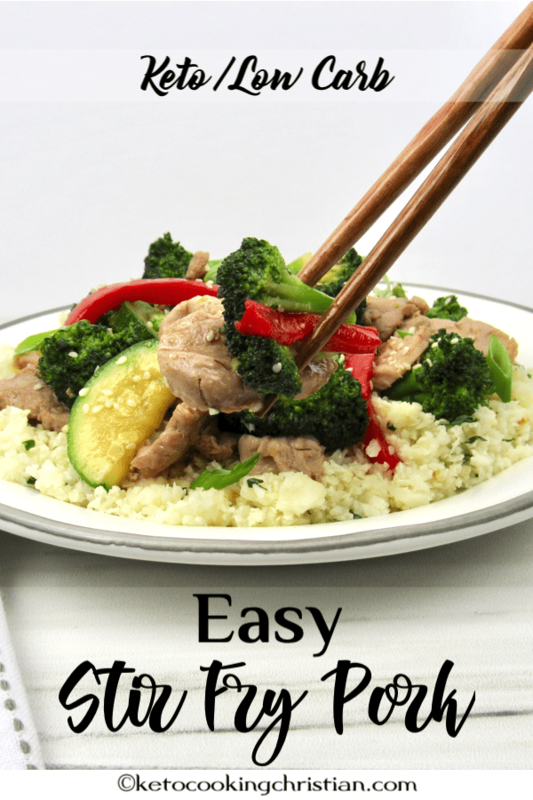 Stir for about a minute, add the broccoli and pork back in and pour the sauce over the top. Stir until combined and cook for another 5 minutes or until everything is cooked through. 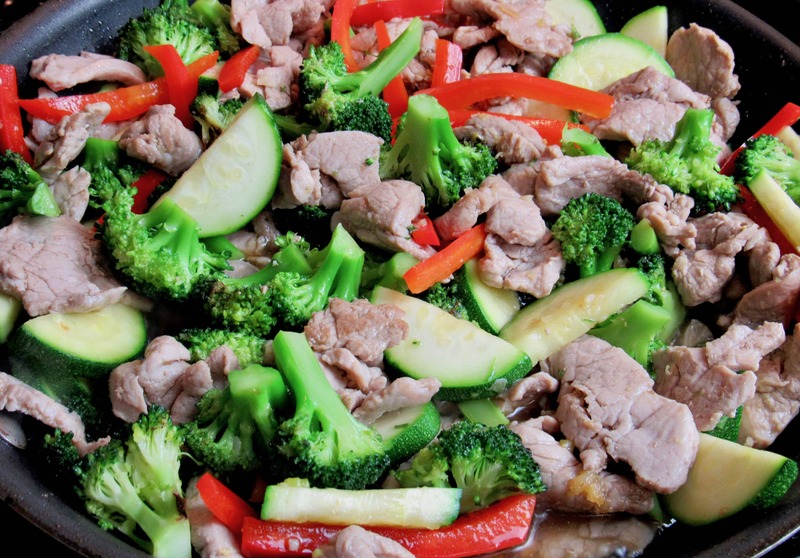 Remove the pork and veggies from the pan, leaving just the sauce behind. Combine the Glucomannan powder with a tablespoon of water in a cup and stir to dissolve. Pour into the sauce, while whisking and cook the sauce until it has thickened to your liking. Mine only took about 1-2 minutes to thicken. Add the pork and veggies back in and toss to coat in the sauce, then serve. I poured mine over my Lime Cilantro Cauliflower Rice and garnished with some sesame seeds. If you cannot get Glucomannan Powder, you can use Xanthan Gum instead. I prefer the Glucommannan because it doesn't get slimy like Xanthan Gum can in sauces like this. With that said, if you use too much, it will take on a strange texture, similar to Shirataki noodles, because in fact this is what is used to make them! Glucomannan is soluble fiber and is derived from the Konjac root. *Macros do not include cauliflower rice. Be sure to adjust according to what you serve your stir fry with.